There is an aspect of bicycle racing which makes the sport particularly attractive to a wide range of people. In many sports, body size is important to success. In basketball for instance, being tall helps quite a bit, big men dominate football, boxing and wrestling match opponents by weight classes, horse racing calls for lightweights and so forth. On bicycles, however, 120 pound men ride shoulder to shoulder with 170 pounders, 5 foot two against 6 foot two. The key here is strength to weight ratio. The smaller man is not as strong, but he has less mass to pedal. This tends to emphasize true inner ability. In bicycle racing, more than any other sport, the best man really wins. This has never been more true than in the case of Stillman G. Whittaker, the great highwheel racer and world record holder from the late 1880's. "Whit", as he was called, stood five feet, five and a half inches, and weighed only 147 pounds when in the pink of condition. During his short career, he beat the best men in both America and England and set many world records. His 24 hour road record for highwheel bicycles still stands. He began life in Boston, Massachusetts on March 4, 1862, the son of Joseph and Sarah Whittaker. The family settled in nearby Bedford, where he spent his childhood. His father died as a result of injuries received in the Civil War, leaving Whit at a very young age to be the man in his family. He began riding the bicycle in 1884 as a member of the Cambridge Bicycle Club in Cambridge, Massachusetts and quickly realized his talent. His first success came in the Boston Bicycle Club's second annual 100 mile road race in August of that year, in which he set an American amateur record of 8 hours, 55 minutes, surpassing the previous record of 9 hours, 20 minutes held by George Weber. He rode a 36 pound, 52 inch Royal Mail bicycle, a British machine imported by William Read & Sons of Boston. Owing to Whit's belief in the superiority of their machine, William Read offered him a position in their sales department. After only a short time there, Read gave him the opportunity to be their agent in St. Louis at the Simmons Hardware Company. He was to head up their bicycle department and sell the Royal Mail by virtue of his accomplishments on it. He moved there in early 1885 and began to develop into the dominating racer that he was later to become. He found immediate success at races at Memphis, Tennessee and Springfield Ohio. At Memphis, out of nine races, he took seven firsts and two seconds. While in St. Louis, he joined the men of the St. Louis Ramblers Bicycle Club, which included fast riders Cola and Percy Stone. The Ramblers as a whole were widely recognized as some of the best road riders in the country. And while Boston was the center of racing activity in the East, St. Louis was headquarters for the West. It was a centrally located transportation hub by virtue of the Mississippi River and the various railways. Chicago, Indianapolis, Minneapolis, Omaha and New Orleans were all important bicycle racing areas and conveniently reached from St. Louis. Whit fit right in with the Ramblers and soon was recognized as one of the best. About this same time Tom Eck landed in St. Louis with his wife, Louise Armaindo, the great woman racer, John S. "Jack" Prince and a few others, looking for opportunities to promote bicycle racing. Eck was an ex Canadian champion highwheel racer who had settled in Minneapolis, and was beginning his career as manager and promoter extrordinaire. Whit fell in with this crowd easily as his talent equaled and would soon exceed anything they had accomplished. That spring Whit traveled extensively, concentrating on road races, for which he was particularly suited. He began defeating such luminaries of the day as George Weber, L. D. "Birdie" Munger, N. H. Van Sicklin, Wilbur Knapp, Herbert Gaskill, Frank Dingley and William Rhodes. And quite incidentally, these competitors were becoming his circle of friends. Bicycle racing during that time was quite a spectacle and many races were as much about show as they were about competition. This camaraderie between the participants became necessary in order to stage the high drama the public perceived in these events. No doubt much of it was serious competition, but often it was carefully orchestrated to please the crowds. Challenges were constantly being bandied back and forth between these racers, with the outcome of an eventual race really being known all along. Which is not to say they were "fixed"; just that there was little doubt whom was the faster man. In retrospect, it was good for the development of the sport as it heightened interest in what could have been an otherwise dull race. However, it also cast a pall over the integrity of the sport which continued well into the next century. Doubt always followed a truly epic performance by one of these men. Throughout his career, Whit was challenging others, and being challenged in return, to match races for tremendous sums of money. Many great races resulted, but often the race never even took place. Nevertheless they received widespread coverage in the cycling press. Toward the end of 1885, Whit began to round into world class shape. During a race at Clarksville, Missouri in August he became the first man to ride twenty miles in under an hour on the road. Lack of official certification, however, prevented its entry into the record books. At the Ramblers' tournament on September 26, he won all bicycle classes and won the one and two mile tricycle races, becoming the only man in America to ever defeat Robert Cripps, the legendary British tricyclist. Cripps enjoyed himself so much at the St. Louis races, even in defeat, that he briefly toyed with the idea of relocating to America. Whit's prize for the one mile race was a beautiful silver plate ice bucket, engraved with the record of his accomplishment. Then on Thanksgiving day, Whit lowered the American amateur 50 mile record held by George Hendee to 2 hours, 55 minutes, 38 and 3/5 seconds. That same day he lowered the American amateur tricycle records from 6 to 10 miles, making 32 minutes, 56 seconds for the ten miles. This was only 23 seconds shy of the world's record. By December, he was well ensconced with the Eck troupe, performing with them at the Fairgrounds, at the Globe Rink and at the Star Rink in St. Louis for turn away crowds. At the Fairgrounds, on a three laps to the mile board track, he once again attempted to ride 20 miles in the hour, this time for a recognized record. For this ride, he used a Kangaroo safety, demonstrating his ability to perform well on a variety of machines. It was cold and windy and he did not quite reach his goal, but he was still a hit with the crowd. Throughout December, he raced in a series promoted by the Ramblers at the Globe, even participating in a race on Christmas day. In February of 1886, Whit took part in an event that was to be a turning point in his career. Tom Eck brought him to his home town of Minneapolis for a huge bicycling and roller skating extravaganza. At that time, Eck was working towards bringing the six day bicycle races which had been so popular in England, to America. This was the last test event before he finally promoted America's first all bicycle six day race (two weeks later at this same venue). He put an eight laps to the mile, slightly banked, bicycle track around the skating track at the Washington Roller Rink. Commencing on Washington's birthday, it was a week long fest alternating bicycle racing with skating races. Whit was the featured bicyclist in what was billed as St. Louis vs. Minneapolis. Ever the showman, Eck met him at the railway depot with a brass band and a contingent of local wheelmen. On Monday the 22nd, in a 20 mile race, he rode the distance against the five fastest amateurs in Minneapolis, who rode as a relay team (bringing in a fresh rider every four miles), and beat them handily. The same format was used on Friday in a 50 mile race, again with Whit easily coming out on top. In between, on Wednesday, he raced against E. A. Savage for 10 miles. This proved to create a problem for him. At that period in bicycle racing history, the League of American Wheelmen was growing very concerned with what it perceived as a creeping professionalism, thinly disguised as amateurism. Amateurs frequently received compensation in the form of expense money or equipment in return for riding a particular manufacturer's bicycle. These racers were referred to as "maker's amateurs" or "promateurs". Whit certainly fell into this category by virtue of his relationship with William Read and Sons, who provided him with the Royal Mails that he rode. To this point Whit had always ridden as an amateur, but Savage was 100 per cent professional. In the LAW's eyes, racing with Savage made Whit a professional also, a class which he really was not desirous of pursuing. Nevertheless, the die was cast and Abbott Bass, the head of the LAW Racing Board, informed Whit by telegram that he was to race only in the professional class until further notice. This served to cement the relationship between Whit and Tom Eck, as Eck the showman was in this for the money as much as the sport. After the Minneapolis show, he hopped a train back to St. Louis, stopped just long enough for about a cup of coffee, and boarded another train for New Orleans and yet another race. Such was the whirlwind life of America's newest professional bicycle racer. Clarksville, Missouri, a little town just up the river from St. Louis, had the best surfaced and flattest roads for miles around, and quite naturally, developed into a popular area for bicycle racing. Later that spring, Whit competed in a road race there promoted by "The American Wheelman", a cycling periodical out of St. Louis. Matched against George Weber, the Easterner whose 100 mile record he had previously broken, Whit took a hard fall, breaking his collarbone and shoulder in the process. Too bad for the St. Louis bicycle crowd, for they had accepted Whit as one of their own, and would have liked nothing better than to see their man prove his superiority over the man from the East. He was always a popular topic of conversation in the local papers. 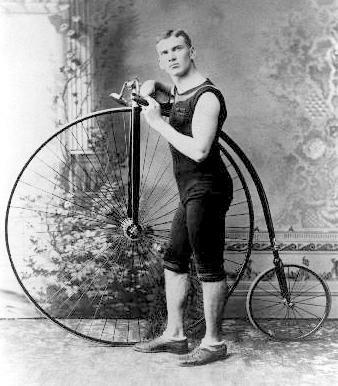 A staunch supporter of the Royal Mail bicycle, he once turned down an attractive offer to ride the Apollo wheel. His rejected suitor tried to turn the rejection into their advantage with an ad in the "American Wheelman". The ad claimed that the Apollo would "out-coast any machine on the market in a fair trial, not withstanding what a St. Louis youth says of another machine". They didn't have to name the "St. Louis youth". Everyone knew it was Whit. During Whit's recuperation, Eck had been busy negotiating with Ned Oliver of the Gormully & Jeffery Company in Chicago to form a traveling racing team. He recruited Whit along with John S. Prince, Wilbur Knapp, L. D. "Birdie" Munger and Frank Dingley. These men were among the best racers in the country in the late 1880's. Eck secured a deal to cover all of their expenses as well as reward them with bonus money for winning races and breaking records. Whit, Knapp and Munger were the road specialists, while Prince and Dingley were indoor track experts. The unfortunate upshot of this deal was that G & J did not make a pure racing machine. However this just served to emphasize the abilities of these racers, as they eventually won many races and broke many records on the Gormully and Jeffery Light Champion, essentially a roadster. These machines outweighed the competing machines from Columbia, Victor and the various British makes by ten to fifteen pounds. But the promise of a chance to make his living racing a bicycle was enough to persuade Whit to give up his beloved Royal Mail. On August 15, he quit his job at Simmons Hardware and immediately went into serious training. Ned Oliver became Whit's new mentor. Tom Eck continued to accompany him in his travels and give him critical advice concerning his training. But it was Oliver, from his desk at Gormully and Jeffery in Chicago, who guided his career and encouraged him to determine his own fate. The affairs of the company were certainly uppermost in his mind, but in their frequent correspondence he showed a genuine confidence in Whit's abilities both on and off the bike. Acknowledging the peripatetic nature of the professional bicycle racer and the home base of G & J, the press started referring to Whit as "Whit of Chicago". Whit's agreement with Gormully and Jeffery also stipulated that his duties were to be breaking records rather than racing. Racing involves much in the way of tactics, whereas record attempts are man and machine against the clock. His fame thus far had rested on the records he had broken and Ned Oliver intended to capitalize on this. Most American pros were expected to be at a fall race meet in Roseville, New Jersey at the end of September. Oliver wanted him to put in an appearance there, but considering Whit's physical condition, decided it would be better that he make a go at some records. Indiana was their choice for location. Indianapolis was pal Birdie Munger's home base and the roads around Crawfordsville, a country town just north of the city, were perfect for a record attempt. After a few weeks of specialized training he was ready to go. On September 24th, Oliver's confidence was well rewarded, for when the dust died down Whit had ridden a hundred miles in 6 hours and 43 minutes. It was a new American record, and it was set on a Gormully and Jeffery Light Champion. When Whit left Bedford, Massachusetts a few years earlier, he left part of himself behind. His young girlfriend Carrie Piper, daughter of a local minister, still had his heart. During his travels and adventures, he maintained contact with her. It was apparent that she was as important to him, if not more so, than his bicycle. He sent notes to her detailing his exploits during his record setting in Indiana, as if to impress her and show that she was in his thoughts. Typical actions for a young suitor, albeit through a long distance affair. Next, as if to confront the Grim Reaper head on, Whit returned to the roads of Clarksville, Missouri, where he had taken such a terrible fall earlier in the spring. This time his sights were set on the world's twenty four hour record. It seems as though his incredible hundred mile record in September was merely a training ride to prepare for this. Ned Oliver continued to direct him in this latest phase of his career. On October 18 he set off on his attempt. On October 19 when he finally climbed off his Light Champion, he had rewritten the record book. He did ten miles in 29 minutes, 1 3/4 seconds; twenty miles in 59 minutes, 35 4/5 seconds; fifty miles in 2 hours, 55 minutes, 46 1/2 seconds; one hundred miles in 6 hours, 1 1/2 minutes; two hundred miles in 15 hours, 30 seconds; three hundred miles in 23 hours, 46 minutes, 16 3/5 seconds. This show of strength and stamina marked him as one of the premier road riders in the country. He stayed in Indianapolis to recuperate and participate in race meet there on November 1. Here he gave a five mile exhibition run, covering one of the miles in 2 minutes, 43 seconds. 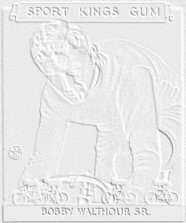 The January, 1887 issue of "The Springfield Wheelman's Gazette", America's premier bicycle racing periodical, ran a profile on him as an up and comer to look out for. This was a man who was fast and getting faster.